Cal-IPC provides several resources to help Californians fight the spread of invasive plants. In addition to the Inventory of invasive plants, we gather an annual Symposium, and maintain a library of resource material. Read the latest Dispatch Newsletter for updates on invasives, or peruse the archive for more than 20 years of information. The newsletter is mailed to Cal-IPC members – join today to make sure you get the next copy! 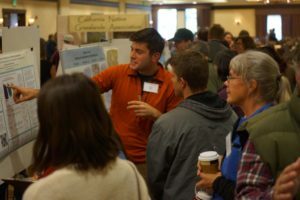 The Annual Cal-IPC Symposium is a great opportunity to meet with other land managers, researchers, and conservationists. We gather to learn, share information, and celebrate success. Join us Oct 15-18 in Riverside! This page also contains links to archived proceedings from more than 25 years of Symposia. Our rich library of information includes books, reports, and brochures. Some items are available to purchase through the Cal-IPC store. Many items are available online as PDF documents. The library also includes a selection of training videos. We have books, brochures, and gear for sale in the Cal-IPC shop. Check it out! California’s wildlands depend on our volunteers. We’re here to help, with information on managing and training volunteers for weedwork. Managed by fellow students, the Cal-IPC student section is dedicated to expanding opportunities for students interested in invasive plant research and management. Can’t find what you’re looking for? Please contact us at info@cal-ipc.org.